The CoffeeShop Blog: CoffeeShop Vivid 2 Free PS/PSE Action! CoffeeShop Vivid 2 Free PS/PSE Action! Update!!! Now I have another version of Vivid; Vivid 3. Check it out!!! Here is the CoffeeShop Vivid 2 free action for Photoshop and Photoshop Elements! You can find the old CoffeeShop Vivid here. This action has 4 different color pop layers which include layer masks so you can remove the pop off skin or anything else if needed. It also has a very easy totally automatic vignette layer and a sharpen layer you can turn on or off. 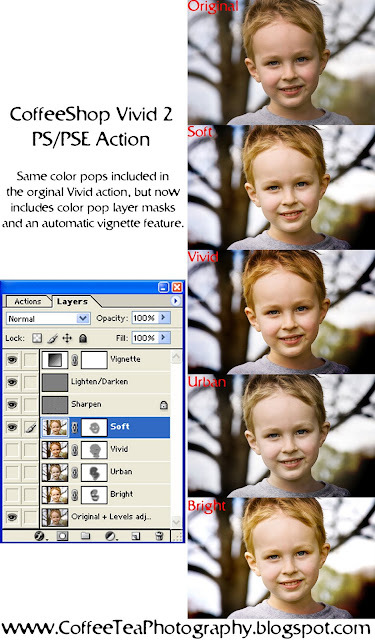 The zipped file includes the .atn action file (for every version of Photoshop, and every version of Photoshop Elements EXCEPT PSE5 in XP where there are some issues...), a .png icon file for PSE6&7, a .psd icon file for PSE4&5, and a .jpg sample of the "action in action". Click here to download CoffeeShop Vivid 2! You can also download it here. Thank you, Rita! I can't wait to try the new action! Thank you for your kindness and sharing! Thank you! Your blog post will be advertised on the DigiFree Digital Scrapbooking Freebie search engine today (look for timestamp: 26 Jan [LA 10:15pm] - 27 Jan [NY 01:15am, UK 06:15am, OZ 05:15pm] ). This looks wonderful - thank you! What are you doing to me? I just starting to recover from my color pop 2 addiction and now you give me a new one??? What can I say but... thank you! This is awesome... Thanks you! Wow! Thank you so much! This is so awesome! I can't thank you enough. I just found your site- and it makes me want to shed tears of joy- cheesy- but seriously. We are completely broke, but I want to learn and only have Photoshop Elements.. so your actions are perfect for me, and with the layers adjustable, I can learn too! You are brilliant. I can't thank you enough. When I do have money- you'll be gettin' some from me. Thank you! This action has the coolest vignette, not to mention the fabulous color actions. Thank you. thank you...can't wait to try this out! wow! I am so grateful!!! Thank you so much for sharing these wonderful actions!!!! You are awesome!!!! A million thanks! The action is not showing in my folder so i cant load it!